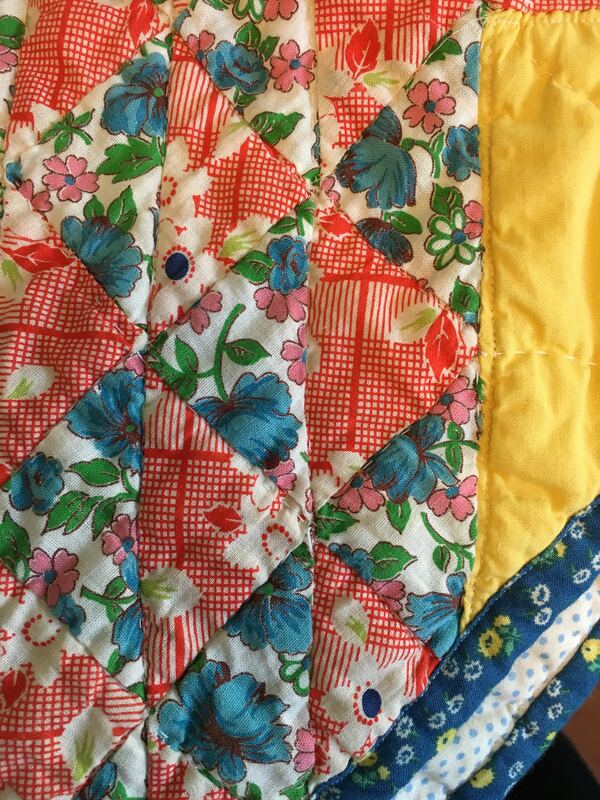 Four generations of women connected through one quilt. I never had the privilege of meeting Phyllis, as she passed away before I met Joel. Everything I’ve heard about his grandma though has assured me we would have been great friends. She was a loving mother and grandmother who loved to host family gatherings, opened her door to everyone, showed her love through her cooking, was the crafter of all crafters, and an exceptional seamstress! As I purusued through all the fabrics and unfinished projects found in some old bins that were given to me by Joel’s aunt Trece, I began to build a more detailed picture of who she was. 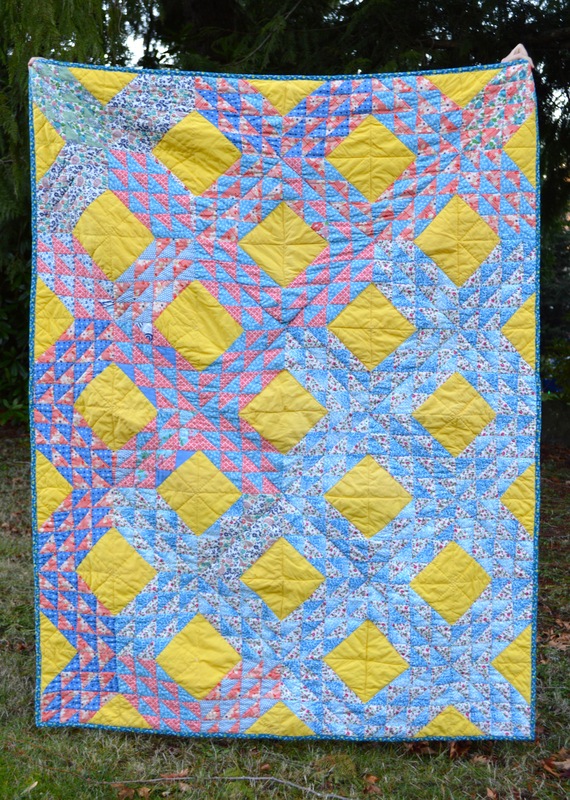 I was invisioning a quilt with all her scraps, dreaming up a pattern with each new piece I pulled out. I was ready to start sketching a pattern when I opened the last bin and found a stunning half finished quilt! 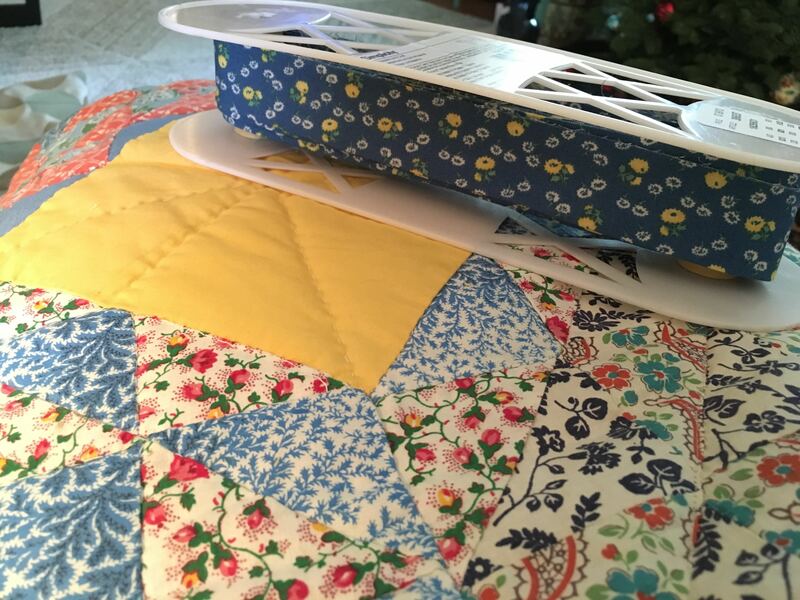 I was speechless and brought to tears as I ran my hands over the hand-pieced and hand-quilted squares. I have never seen a quilt as beautiful, and could tell it was an unfinished labor of love. Immediately I knew I needed to finish this quilt and give it to a very special woman in my life, my mother-in-law, Susan. 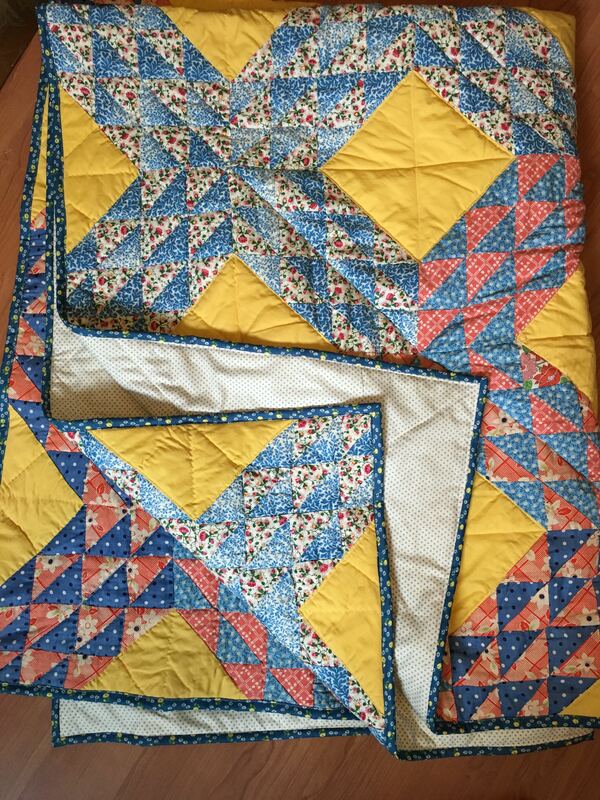 A finished quilt, four generations later. It took me six months to finish the quilt, just in time for Christmas. 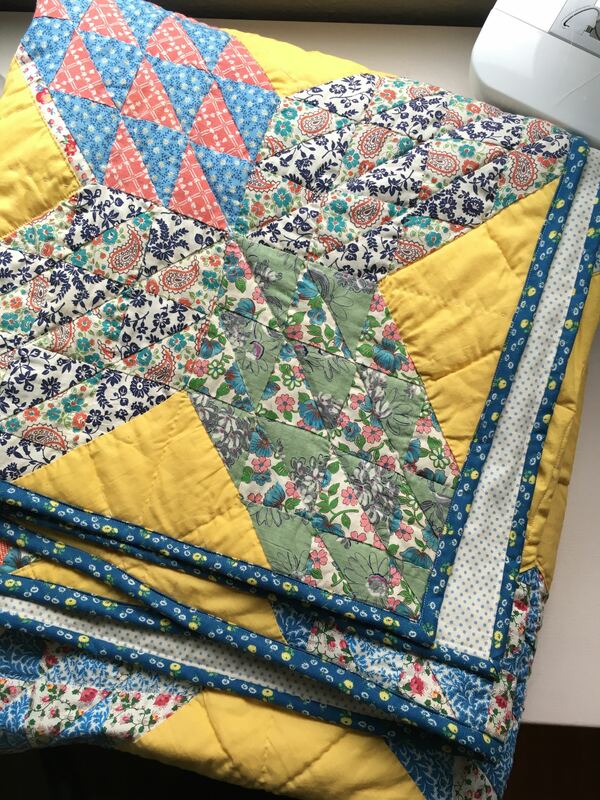 I ended up re-basting it, adding an additional layer on the back, and machine quilting in the seems to reinforce the quilt, without sacrificing the integrity, look and style of the quilt. I found the vintage inspired backing fabric and binding at Pacific Fabrics, and it coordinated perfectly! 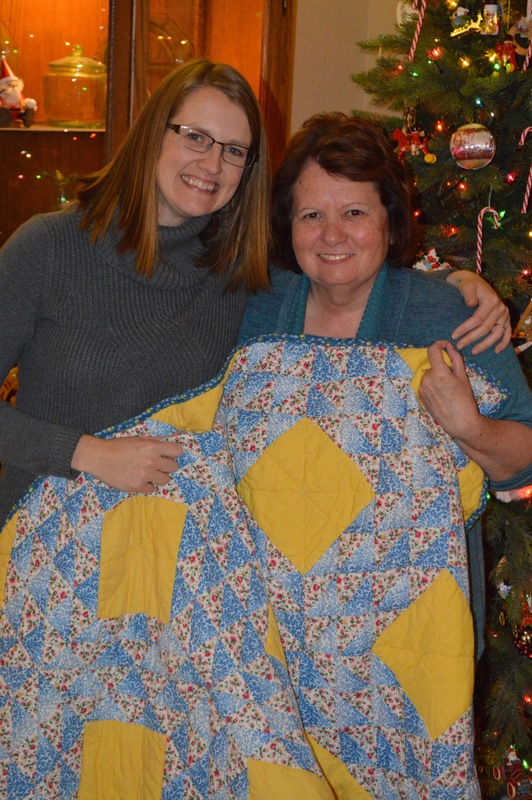 The best part about this quilt’s story, is that as soon as Susan opened the quilt on Christmas, she immediately recognized it! 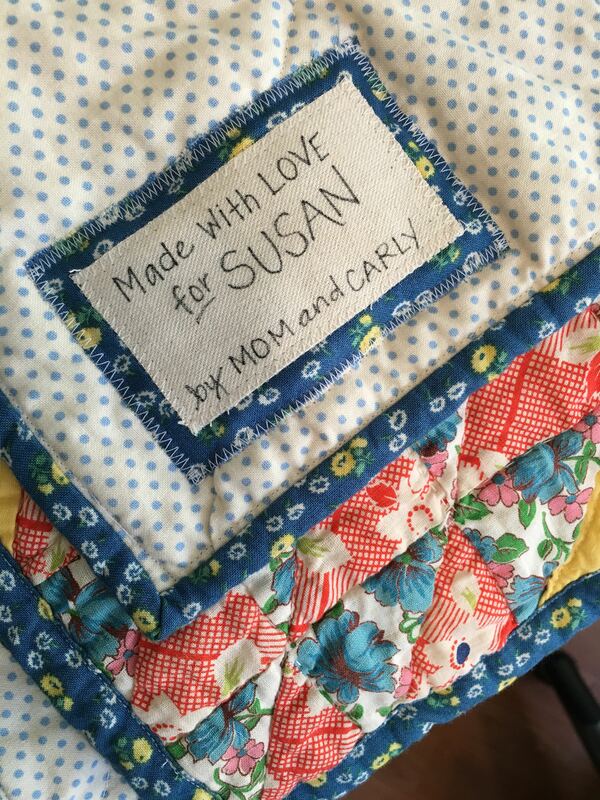 I soon learned she had once been apart of the making of this quilt, as well as her mom Phyllis, and her grandmother. And now four generations later, it is complete, and no longer headed for the Goodwill bin! Thank you, Trece, for sharing these bins of fabric and treasures with me. It has been an honor to finish a few of your mom’s precious projects for her. And thank you to everyone in the Pryde family for always sharing the stories and traditions that began with Phyllis. I feel like I know her and am so proud to be apart of her family with each of you. After a while, whether you are attending or vending, craft shows can all seem to be the same. A mixture of craft home decor, grandma’s crochet, paper arts, jewelry, and a few direct sales tables (tupperware, etc). They can be really fun, but over the last two years, Heidi and I have really started to question if this is the right avenue to explore for our business. Then we met Katie, who coordinated our first show at the Indie Banditas Bazaar, and she said “You guys need to be at Urban Craft. You’re the perfect fit for that show.” And we were like… “uh, what’s Urban Craft?” After she walked away from our table, we immediately googled it and instantly fell in love with the entire philosophy. We were accepted into our first show with Urban Craft Uprising this last June and had an amazing experience. Each show is carefully curated and juried to ensure the best mix of crafts and arts, along with quality and originality. This bi-annual show features over 150 vendors excelling in the world of craft, art and design. Over the course of 12 years, UCU has garnered so much attention that over 16,000 fans swarm to the show over the course of the weekend. Clearly, our biggest show to date so we worked our buns off building our inventory. The entire show was so well done, and we were given so much information on a weekly basis by the organizers. Despite it being a huge unknown participating in a show that large, we definitely felt prepared and supported by the organizers and other vendors. We are working on our “Craft Fair Prep 101” list to work off of next time (yes, we are hoping to be a UCU vendor again soon!). The best part about the show was being able to connect with all our customers. Having a primarily online shop, being able to see and visit with our customers was a huge treat. And we were able to get valuable feedback about our products and what people loved most. For all our Washingtonian friends, we highly recommend this show as a shopper, too! So mark your calendars for the last weekend of June, and the first weekend in December, and head over to the Seattle Exhibition Hall. Here’s a photo of some of my favorites picked up at the summer show, including pieces from Red Umbrella Prints, ElSage Designs, and Specks and Keepings.